On this occasion, it would appear that Mount Athos has become the target of those who brazenly produce fake news. Indeed, it has been reported that the Holy Mountain allegedly denied the Ecumenical Patriarch the right to send an official Athonite delegation to Kyiv for the enthronement ceremony of the new autocephalous church’s first primate, Metropolitan Epiphanius. According to the official correspondence, published by orthodoxia.info, on January 25 (or 12, according to the old calendar) the Athonite community received a letter from the Ecumenical Patriarchate written by Metropolitan Epiphanius in which the Ukrainian primate invites the monks of Mount Athos to participate in his enthronement by sending a delegation. 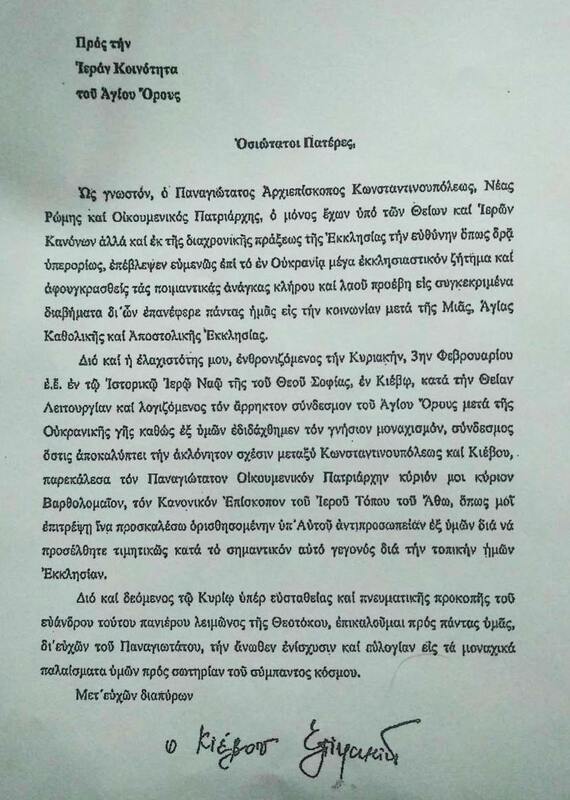 As per protocol, the letter was sent to the Holy Mountain not directly, but through the Ecumenical Patriarchate. 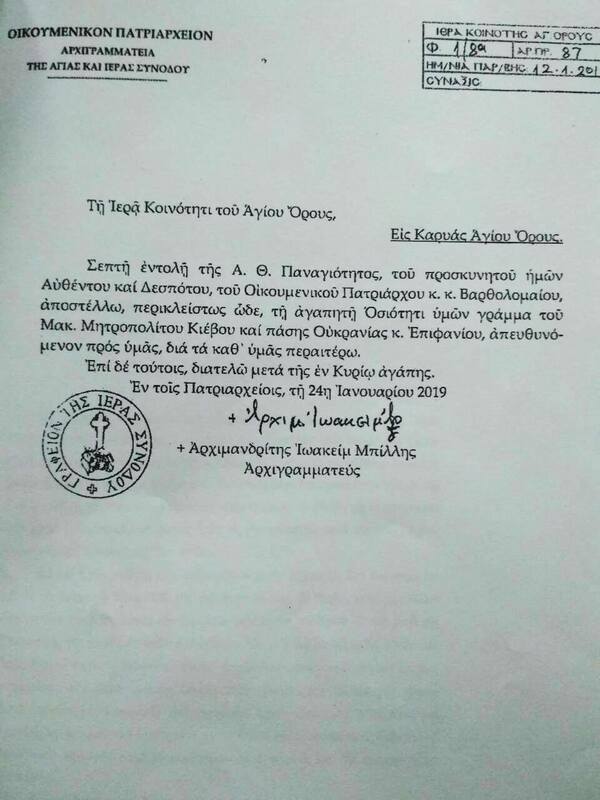 And as can be seen from the accompanying note signed by the chief secretary of the Ecumenical Patriarchate’s Holy Synod, the letter was simply forwarded to the Athonite community without Patriarch Bartholomew intervening and making the request his own. As a result, the governing council of Mount Athos convened in an extraordinary session on January 28 in order to make a decision on the letter. By majority, it was decided that the Holy Mountain would not send a delegation to the enthronement ceremony, not because the Fathers do not recognize its legitimacy or canonicity, but because they have chosen to stick with what has become official practice and accept invitations only to the enthronement of their ecclesiastical head, the Ecumenical Patriarch. In any case, the way in which the whole issue was brought into the limelight can only be described as anything but innocent, as Mount Athos has effectively now been portrayed as a rebel stronghold resisting the Ecumenical Patriarchate. 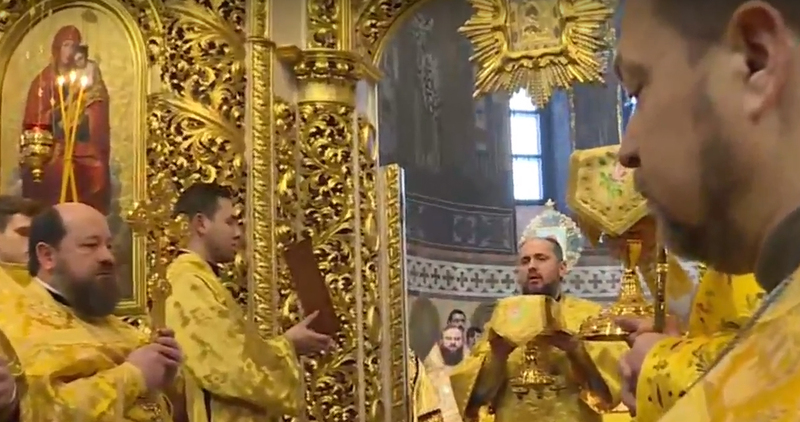 It should be noted that the website which made the original post had also recently reported that Metropolitan Simeon was leaving the autocephalous Ukrainian church and returning to the UOC–MP. Yet this hierarch ended up participating in the new autocephalous church’s delegation to the Phanar on the day the Tomos was officially granted. By divine order of His All-Holiness, our venerable Lord and Master, the Ecumenical Patriarch Bartholomew, I am sending your beloved righteousness, attached herein, a letter from His Beatitude, Metropolitan Epiphanius of Kyiv and All Ukraine, addressed to you, for your reference. As is well-known, His All-Holiness, the Archbishop of Constantinople–New Rome and Ecumenical Patriarch, the only One who, by virtue of the Holy Canons as well as by the Church’s undertakings throughout time, has the prerogative to intervene beyond His jurisdictional boundaries, has looked favorably upon the great ecclesiastical question of Ukraine and, having taken into consideration the pastoral needs of the clergy and the laity there, has taken certain steps in order to reinstate us to canonical order with the One, Holy, Catholic, and Apostolic Church. For this reason, my humility, to be enthroned on Sunday, February 3 in the historic church of the Holy Wisdom in Kyiv during the divine liturgy, well aware of the deep ties uniting the Holy Mountain with the Land of Ukraine—it was by you that we were introduced to true monasticism, and this is a link which reveals the unshakeable ties between Constantinople and Kyiv—has asked His All-Holiness the Ecumenical Patriarch, my Lord, Bartholomew, the canonical bishop of the sacred realm of Athos, for permission to invite an Athonite delegation, to be determined by Him, to honor our local Church by attending this important event. Therefore, praying to the Lord for the stability and spiritual prosperity of the noble and all-sacred pasture of the Theotokos, I invoke upon all of you, through the prayers of His All-Holiness, strength and blessings from above in your monastic struggle for the salvation of the whole world.